(2 Customer Reviews) | Write Review 4 issues per year If you love to play, love to listen to or simply love to discuss organs as an instrument, this is the magazine for you. 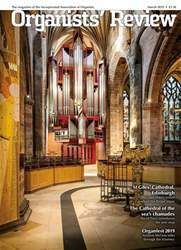 It provides a kaleidoscope of the organ world, with articles, information and stunning pictures covering a wide range of organ related topics. In addition to regular features such as new music and CD reviews, each issue explores in depth a theme of current interest. Starting life primarily as the quarterly magazine of the IAO it is now available to all. Looking for Organists' Review in print? Unfortunately pocketmags.com does not sell print copies of Organists' Review, but all is not lost. Our partner at magazine.co.uk sells print subscriptions at the best prices online. This issue has us talking Italian – even though disappointingly Robert De Niro doesn’t get mentioned in Chris Borg’s article about organs at the movies. 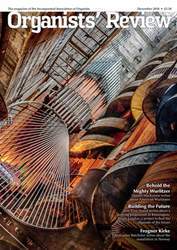 The impressive installation by Fratelli Ruffatti at Buckfast Abbey features in the lead article and therefore appears on the cover and as the pull-out. Keeping the Italian theme running Peter Clark writes about the music of a contemporary Italian composer, Carlotta Ferrarri. Paul Hale goes slightly further afield to Malta, looking at the work of August Gern who worked with Cavaillé-Coll. Finally, Steven Grahl writes about the Music Festival which is being held in Peterborough this year. The newly-pitched Hill organ in a beautiful Norman cathedral should be a delight to hear. Booking forms are included at the end – so keep an eye out for them. If you love to play, love to listen to or simply love to discuss organs as an instrument, this is the magazine for you. It provides a kaleidoscope of the organ world, with articles, information and stunning pictures covering a wide range of organ related topics. In addition to regular features such as new music and CD reviews, each issue explores in depth a theme of current interest. 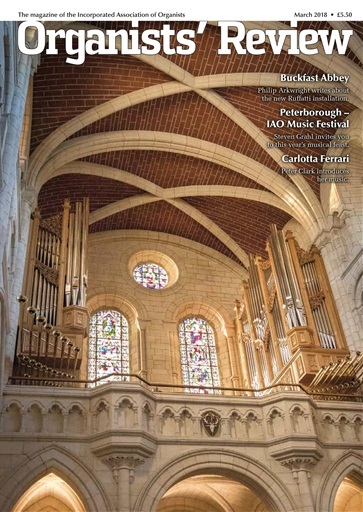 You'll receive 4 issues during a 1 year Organists' Review magazine subscription. I have just come across this magazine. Amazing! Will keep referring back. Thanks for bringing this magazine online! This is the the best of the organ magazines. 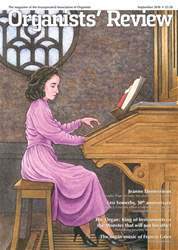 You'll receive 4 issues during a 1 year Organists' Review magazine print subscription.